This is my summer to make my first quilt and I am so super excited about it. You have to check out Heather Bailey's new fabric collection for Free Spirit (look at the slide show she put together). I'm usually not into such bright colors but I love these. 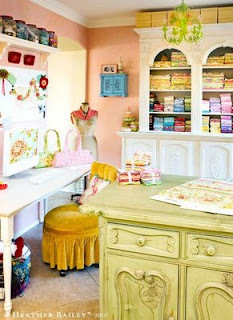 I first found out about Heather when I was looking up Art/craft room/studios. I fell in love with hers. How could you not? Then I posted a photo of her cute hair when I was going back and forth about the bangs. I couldn't even remember where I found the photo of her at the time. I just thought her hair ROCKED. Then I found out the funniest story. My baby sister Buffy has a best friend named Jessilee. She's a funny girl who cracks me up. Anyhow, Buf called me to tell me that Jess saw the photo of Heather on my blog and that she knew her. I guess she went to the same church and Jessilee had nicknamed her Kat (I think because we both have super cute style, he he). I thought this was so random and silly. Jessilee if you read this, post something, I'm sure you could make the story sound more entertaining. Point is, I think it's fate that I use some of her new fabric on my first quilt. That is neat that you like Heather Bailey. I have been a fan for a little while as well. I met her about a month ago. She is super sweet and cut. I know you would like her. That was a funny, unexpected story. 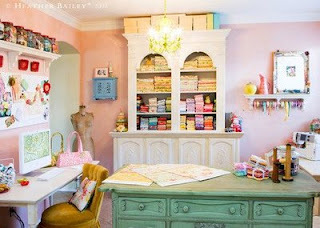 No wonder you found her blog...that craft room is very cute. A get together at your place sounds great! I'm up for it anytime. I'd love to see all the fun little projects you're busy working on while over there! You are always up to something CUTE! Def fate. I have a quilt I started last winter and I really need to finish it. I was doing it all by hand though as my office/whatever room is under construction. If you start yours, I'll get back to mine. That's cool. What a small world. I worked on my quilt tonight for the second time. I have to say, it was a lot less stressful for me this time because slightly more familiar with it---only slightly though. But it's starting to look like a quilt, which makes me so happy. I've never heard of Heather Bailey---but I'm also not so stylin'.